This low carb Mexican zucchini and ground beef recipe is a simple dish made with low cost ingredients. It’s an easy low carb high fat dinner recipe perfect for summer. We had a really good zucchini crop this year. The last few years, our plants ended up getting powdery mildew so they didn’t produce but one or two fruit. However, I think some of that was due to us overwatering the plants in the evening. This year, there was a lot of rainy days so we didn’t bothering adding any additional water and the plants did amazing. Chopped zucchini pairs well with ground beef. I came up with this Mexican Zucchini and beef skillet dish recipe one night for an easy dinner. I’ve made a similar dish in the past using leftover salsa. This time, I just added a whole can of diced tomatoes with green chilis. I added a few Mexican spices to give it a little more flavor to make up for the salsa seasonings. If you can’t find canned tomatoes with chilis, a can of regular diced tomatoes will do. You can even add a few diced peppers if you have some. I typically just taste as I go and look around to see what ingredients I have on hand that would be great additions. My cooking is super simple as I don’t have a lot of time to fuss. I like to slice up fresh zucchini into bite size pieces. My favorite cut is to cut each slice into quarters. You can cut them into smaller diced pieces, if you prefer. It’s been a long time since I’ve bought actual ground beef. When I call for ground beef in a recipe, that means ground hamburger venison for me. We always have a freezer full of ground venison which seems like an endless supply. Zucchini tastes best when it’s cooked al dente. If you cook it too long it gets mushy which isn’t good. Cooking the zucchini for five to ten minutes in the covered skillet should warm it up and still keep it firm. 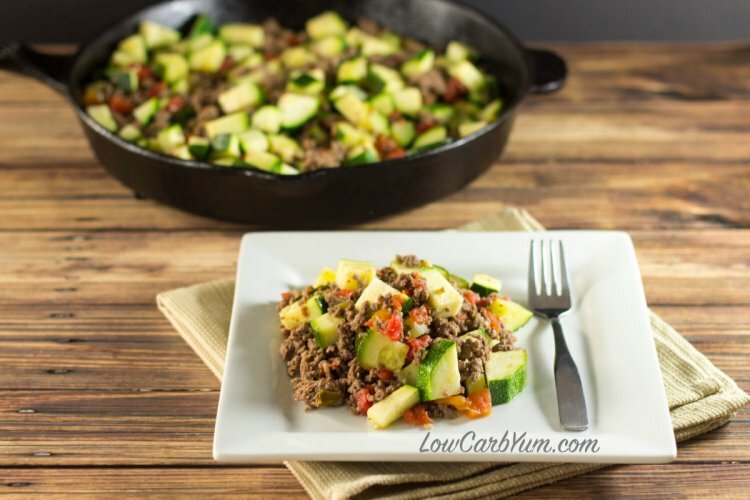 This low carb Mexican zucchini and ground beef skillet dish is a simple recipe that uses inexpensive ingredients. It goes well with cauliflower rice. What’s your favorite way to eat zucchini?